A total of ninety six paddlers braved the freezing temperatures on Sunday 12 February to compete in the 6th and final race of the 2016/17 Winter Series at Leaside. 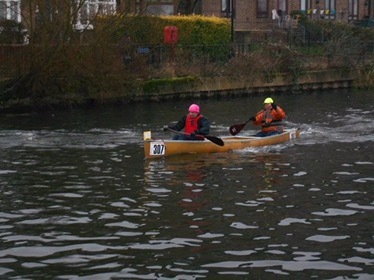 Barking and Dagenham had nine entrants, of which four were in the competitive K2 over 16yrs class. Our K2 DW trainees Ruth Stubbs and Angie Flight have made massive improvements over the course of the series. Before the race they were discussing a dreaded tunnel on the DW course and joked that if another boat were to fall in instead of them, they would be useless to help. However, they came across a stranded K1 paddler who had fallen in and immediately stopped to help rescue him. Well done girls, your first boat rescue! It was a successful day for Barking and Dagenham paddlers overall and especially for members who took home the following awards. Trish True won her race and 1st place overall in the Class 18 Female GP. John Green, with his partner Ron Dains, reclaimed the C2 Touring Class 13 trophy. This is the 8th time, with various partners, John has won. Danielle Clifford and Romeo Balla collected their 1st place series cup for K2 Under 16’s. A straight 5 out of 5 wins. Tobias McCready achieved a well-deserved 3 rd place series trophy for class 15 Male K1 under 14. In the club league table, Barking and Dagenham won 3rd place overall. Another trophy for our cabinet. A very well done to everyone who entered. And a big thank you to everyone at the club who helps behind the scenes, we couldn’t accomplish all this with out you!